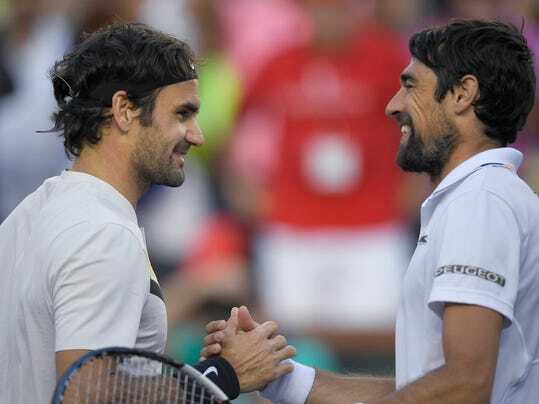 INDIAN WELLS, Calif. (AP) — Roger Federer defeated Jeremy Chardy of France 7-5, 6-4 in the fourth round of the BNP Paribas Open on Wednesday, and at 15-0 the top-ranked men’s player is off to his best start since 2006. The 36-year-old Swiss superstar can equal his season-best start of 16-0 with a win in the quarterfinals, where he will meet Chung Hyeon of South Korea in a rematch of their Australian Open semifinal. He advanced to the final in Melbourne when Chung retired in the second set trailing 6-1, 5-2 because of blisters on his left foot. Federer went on to win a five-set final against Marin Cilic for his 20th Grand Slam title. Chung, seeded 23rd at Indian Wells, beat 30th-seeded Pablo Cuevas of Uruguay 6-1, 6-3.